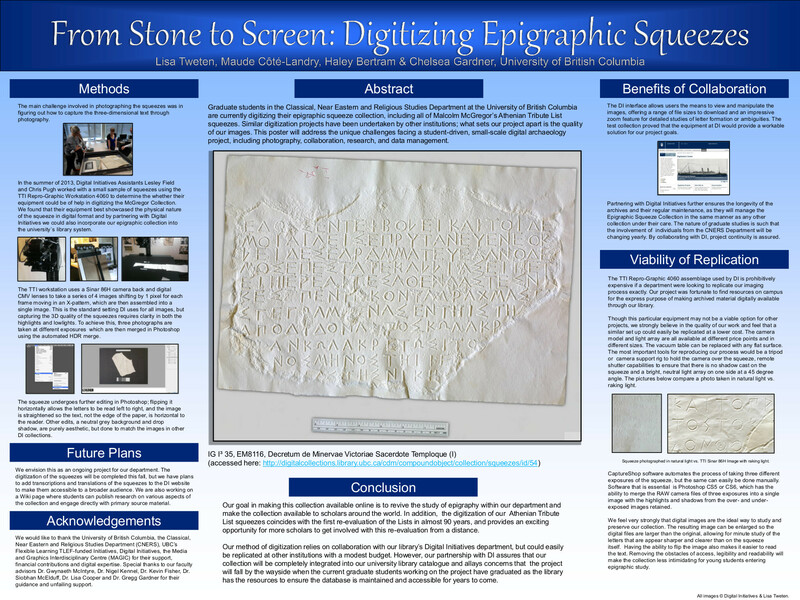 If you follow us on Twitter or Facebook, you may have heard that we were presenting a poster at the International Conference on Information Technologies for Epigraphy and Digital Cultural Heritage in the Ancient World in Paris at the end of September. I can’t think of a conference more tailored to our specific project aims, and we were thrilled both with the chance to present our work to the epigraphic community and to be able to travel to Paris for a week. The conference was organized by the Europeana Eagle Project and hosted by the École Normale Supérieure and the Collège de France Chaire Religion, institutions et société de la Rome antique. It was, in the words of keynote speaker Tom Elliott, an opportunity to “bring together people with unknown projects for collaboration and exchange” but also a chance to “recognize the valuable traits we all share; respect for the past and inquisitiveness” as we work on the “resurrection and reintegration of ancient texts into active memory”. There were some incredibly exciting projects shared over the three day conference, many of which I will share in subsequent posts, but for now I’d like to try to impart a little of the excitement Dr. Elliott started us off with. If the name is not familiar, Dr. Elliott is the Associate Director for Digital Programs and Senior Research Scholar at the Institute for the Study of the Ancient World. He began his adventures in digital epigraphy in 1995 at UNC Chapel Hill in North Carolina as a graduate student digitizing 35mm slides, a project which quickly evolved into EpiDoc. EpiDoc is an international, collaborative effort that provides guidelines and tools for encoding scholarly and educational editions of ancient documents. It uses a subset of the Text Encoding Initiative‘s standard for the representation of texts in digital form and was developed initially for the publication of digital editions of ancient inscriptions (e.g. Inscriptions of Aphrodisias, Vindolanda Tablets). Its domain has expanded to include the publication of papyri and manuscripts (e.g. Papyri.info). It addresses not only the transcription and editorial treatment of texts themselves, but also the history and materiality of the objects on which the texts appear (i.e., manuscripts, monuments, tablets, papyri, and other text-bearing objects). We have to remember that it is impossible to become an expert in all fields; few historians, archaeologists or epigraphists graduate from their program of study having also obtained a computer programming degree. At times, it seems the humanities field is destined to always lag behind in terms of technological advancement. The EAGLE Conference, however, quickly put this false idea to rest. As digital media becomes more and more integrated in our daily lives, more and more are we able to pick up the basics and begin the process of digital cultural heritage management, which is going to be vital to the long term preservation of our shared history. Part of this success is due to the technological community’s commitment to open access software and generosity in creating tutorials, sharing information and trying to create a level playing field. One of the most inspiring things that came out of the EAGLE conference was the almost unanimous commitment from all scholars to openly share their methods and results. The greatest thing the internet can provide is the democratization of education and it is thrilling to know that our project can play a small role in bringing information out of the locked storerooms of academia. Dr. Elliott’s speech encouraged us all to “keep thinking forward; plenty remains to be done,” and reminded us that we are “the antidote to the destruction of cultural heritage”. Put that way poking around old storerooms, writing funding grants and toiling away teaching ourselves coding seems much more exciting.